While I love Christmas and Christmas decorations, I admit that I used to dread the thought of putting up the artificial Christmas tree. I'm small, I'm not very strong, and a few years ago I hurt my back. Although it's was a relatively small back injury, as back injuries go, it's never been the same. Awkward tasks like getting out the Christmas tree and bringing it into the living room, always made me nervous. Thanksgiving weekend is not the time to hurt your back. To make matters more frustrating my husband is often out to sea from Labor Day to just a few days before Christmas. So i like to have the Christmas decorations up when he comes home. A few years ago I was visiting friends on January 1st. My friend cheerfully said, "Well time to take the Christmas tree down." She took out her ornament storage box, put away the ornaments. Them she took the tree skirt and turned it into a bag, wrapped up the Christmas tree, and put it in the hall closet. The whole process took less than a half hour. She said she could put the tree up just as quickly because the lights stay on the tree. That was when I decided that I too would have a Christmas tree storage bag. In fact that's the one to the right. Now I just roll out my Xmas tree on Thanksgiving and have the whole thing decorated within in a hour! Enjoy it during the holidays and easily store it after! Measure your artificial Christmas tree, so you'll know how big the storage for your Christmas tree needs to be. Decide if you need to have wheels or not. Sometimes wheels make it hard to go upstairs. If you're staying on the same level area, wheels may make your life easier. 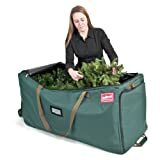 Some people decide to carry their Christmas tree up to the attic in pieces and then put it in the storage bag for the Christmas tree. There is no best answer. It's whatever works best for you. 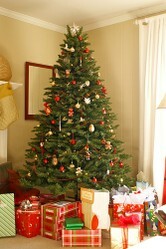 Will you be storing your Christmas tree vertically or horizontally. This depend both on the size and configuration of your storage space and what works best for you. With my back problems, bending over and then lifting a box with an artificial tree would be scary at best. So for me the best idea is to just roll it out have it standing. With the bag that turns into a tree skirt, I don't even have to lift the Xmas tree out of the bag. Do you prefer keeping that Christmas tree in one piece with the lights on? 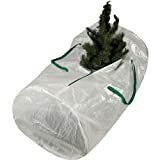 Never knew tree storage bags existed! Let a Santa tree topper complete your Christmas tree decorations. Here's a great selection of colorful Santa tree toppers, white and gold Santa toppers, and even vintage.